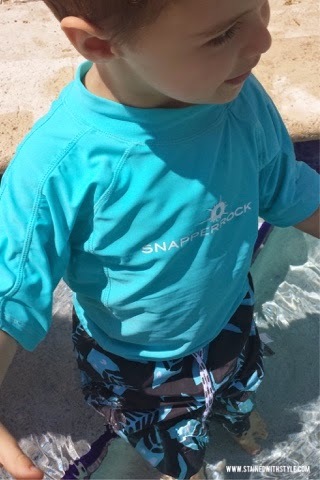 Sun Safe Swimwear for the Kiddos! Hello, my name is Christy, and I am kinda super crunchy. In the last few years, my family has done a complete overhaul of our products. I went through my makeup and shampoo. Everything had to go! I suffered major withdrawal, but I found some that I liked and met my crunchy requirements. Since then, I have been on the hunt for other safe alternatives for my family. One "got-to-go" item on the list was sunscreen. 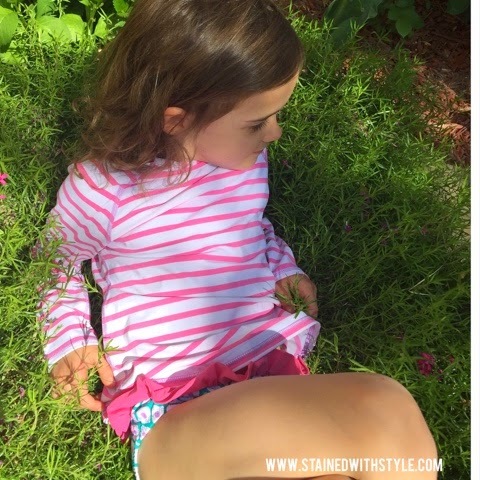 Some studies have shown that conventional sunscreen may have issues...especially for kids, but you can't send that tender kissable skin out without sun protection. What's a crunchy-mama to do? Never fear, simple solutions are here. Babies under six months aren't able to use sunscreen anyway, so the only option you have is to keep them covered. Here are some of the things that I have used to keep them safe in the water. Thankfully, as they get older, you can use sunscreen. Generally, I still try not to use any. HOW?! Easy, with a little help from my friends at Garnet Hill Kids. They have super cute options like these: rash guard swimsuits for the R3 and for the Honeybadger! Unfortunately, they don't have baby wear so I generally stick to this or this. It just depends on your price point. I have even found them for the girls at Target, but the Honeybadger ended up needing to wear Belle's bottoms, so the matching thing went right out the window. Seriously, I bought the HB a size 5, but the 18 MONTH SIZE FIT MY 5 YEAR OLD BETTER! Uggggg! It was a lot less complicated for sizing with the Garnet Hill suit. I even ordered the wrong size and was able to exchange it very easily! Summer is coming peeps, keep those babies covered (and cute)!